Debuting on January 12, 2019, as the first major component of Take ‘Em Down NOLA’s Build ‘Em Up initiative, is the premier issue of “Roots Rising: The Take Em Down NOLA Zine.” This will be the first and only official account of the grassroots movement that catalyzed the world with the removal of four white supremacist monuments right here in New Orleans. Hear the stories from the organizers themselves, learn how the power of the people made change and support the movement that made history in our city. A limited amount of copies may be purchased at several events at which Take Em Down NOLA will be represented in the coming months. If you are interested in owning a copy, selling or displaying them in your bookstore or library, or partnering with Take Em Down NOLA to promote the zine, visit the website at www.takeemdownnola.org or email info@takeemdownnola.org for more info. Take Em Down NOLA has launched a Build Em Up NOLA initiative, and this event serves as a launch effort, and we can't wait to see you there! ADVANCE TICKET SALES EXTENDED TO 2PM (CST) TODAY! After 2pm, tickets will be $15 at the door. We are gearing up for an amazingly fun, celebratory night! 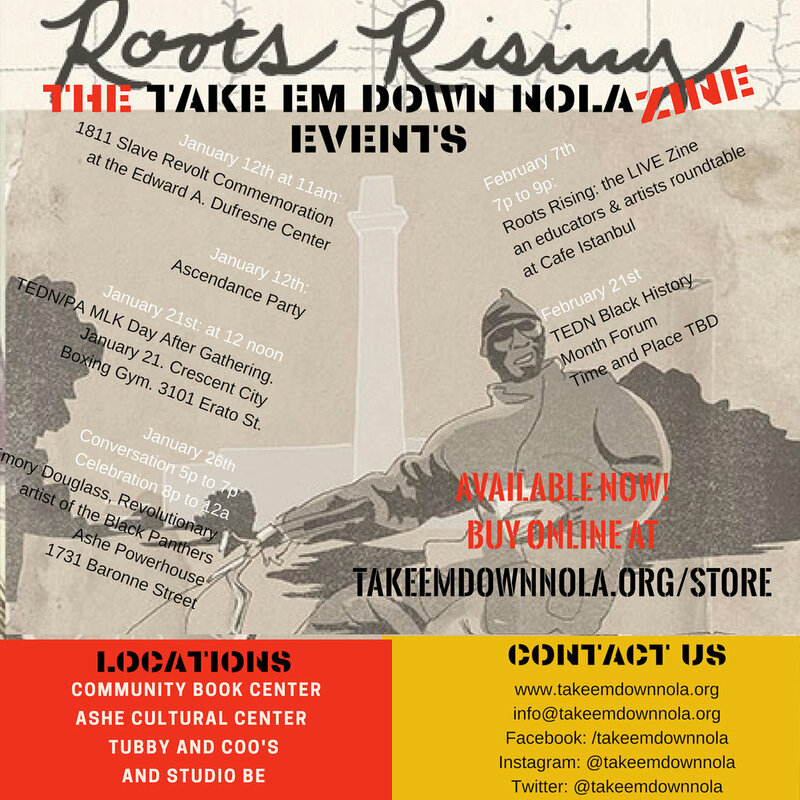 Peoples Assembly is collaborating with Take Em Down NOLA to host a Bounce Concert & Dance Party. 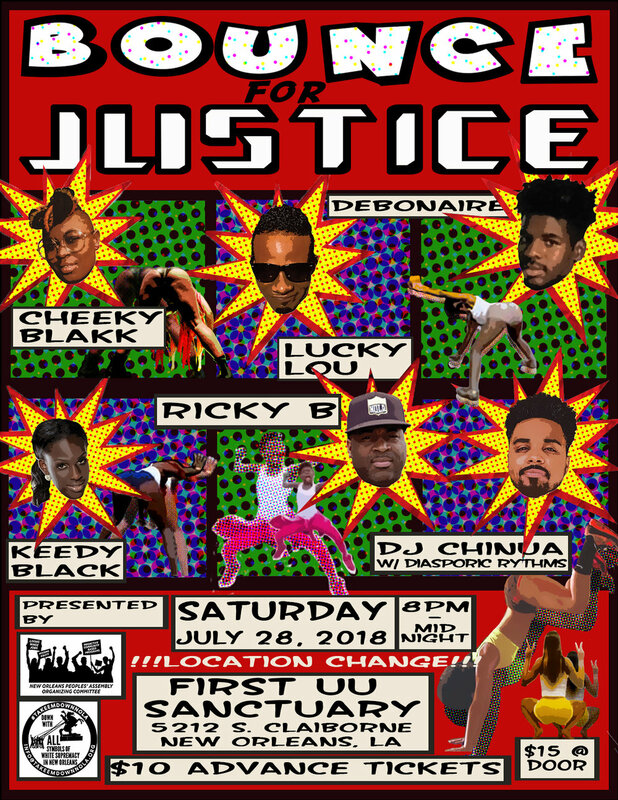 We bout to bounce for justice, and dance our way into a new phase of the work! The dance party will consist of a blend of diverse music, for your ultimate dancing pleasure. This love in the form of music will be brought to us by DJ Chinua. Food, drink, and an amazingly good time will be available. Only tickets purchased on-line by midnight on Friday will be honored. All tickets purchased on Saturday will be $15 at the door. Follow-up with DJ RQ Away on the 1s & 2s. Good Music & Good Vibes!!! While white supremacists gather from many states around confederate monuments in OUR CITY, the mayor nor council has still not publicly called for its own ceremony to honor the historic occasion of 4 monuments to slavery coming down. Even the conservative governor of S.C. had a public ceremony to remove the confederate flag. Cowering in darkness offers no safety or protection, it is shameful and being questioned by world wide media. What does this say to Black youth? What does this teach white youth? All eyes are on New Orleans. It is fitting that during Jazz Fest Week the people have our voices heard. Not just on the monuments, but for racial equality and economic justice for those who built New Orleans, whose heritage is leveraged for profit and who are being displaced. In the name of the good people of New Orleans, in honor of our civil rights veterans who fought for decades for their removal, in appreciation of the Black community, elders and youth Take Em Down NOLA is issuing this call for everyone to come out! Spread this on emails, social media, call your friends. Make History! In remembrance or Rev. Avery Alexander. We urgently need your financial support to do this right. Please go right now to make an on line donation. 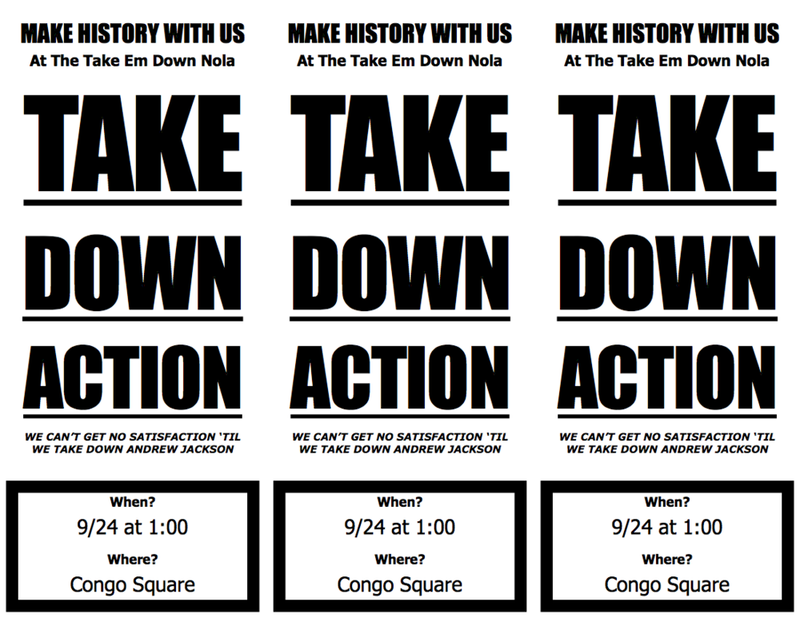 Take 'Em Down NOLA will hold a press conference to discuss updates on the work to remove symbols to white supremacy from New Orleans, as a necessary part of the struggle for racial and economic justice. We urgently need financial support for flyers, posters, stage, sound, banners, ads, and other materials. We need the funding immediately to do the necessary organizing. Your support can make all the difference. Please print, share, and distribute widely! On December 17, 2015 New Orleans City Council voted 6-1 to remove 4 monuments to White Supremacy. Since then, they have allowed domestic terrorists, white supremacists groups and 3 Republican judges to scare them into not moving. It's time to make city government stand up and do their job. On Thursday, September 15th, at the Christian Unity Baptist Church, from 6 p.m. to 7:30 p.m. Take Em Down NOLA will be hosting a community forum aimed at gathering public support from both present allies and as many new supporters as possible. The forum will give an update on the pending court case on the monuments. The case takes place in two weeks, on September 26th, when the Fifth Circuit Court of Appeals will decide whether or not to remove the injunction currently preventing the city from taking down four white supremacist monuments. Who: Take 'Em Down NOLA and YOU! When: September 15th, 2016, at 6 p.m.
Why: Because these racist statues should have come down a long time ago! How to help: Bring yourself, bring a friend, use your voice! If the injunction is removed, the city can resume taking bids to bring down the monuments. If the injunction is approved, the monuments will have to remain in place until the case for removal can be heard at the district level. Either way, it’s time to mobilize and we need all Take ‘EmDown NOLA supporters to get active! Please RSVP on our Facebook event page and share. And share the flyer below (and attached) on Instagram, Twitter, and any other social media you use. Food and refreshments will be provided! We look forward to seeing you there!